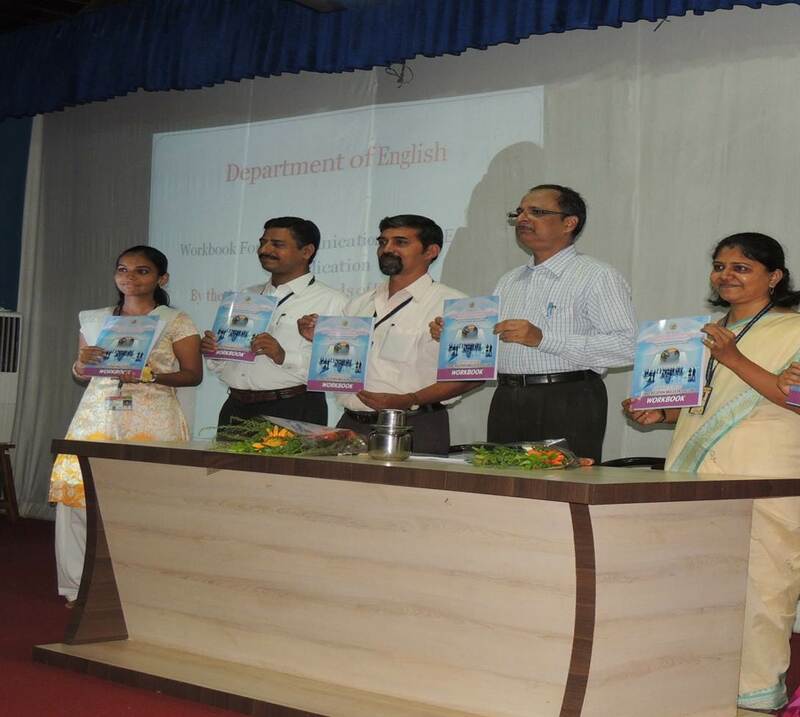 The publication of workbook in the Communication Skills in English , designed for the FYBA students and launching of the website of English Department took place on 15 July 2015 at Radhabai Shetye Auditorium of GJC . Principal Dr. Kishor Sukhatankar, Vice principle of Arts ,Dr. Chitra Goswami, Head of English Department Dr.Atul Pitre , Prof . Vasudev Athalye, Prof. D. S. Kamble and Prof. Madhura Athavale and the students of the department were present for the programme. Both the CS Workbook and the Website were published by the auspicious hands of Dr. kishor Sukhatankar. The department has been consistently publishing the workbook for last two years. This year the department came with the third, revised edition of the workbook introducing additions and changes as per the new exam pattern. Prof. Athalye explained to the students the features and usefulness of the workbook in their studies of Communication Skills, while the features of the website ‘gjcenglish.in’ were explained with demonstration by Prof. Madhura Athavale. Dr. Sukhatankar, being the chair-person of the programme congratulated Dr. Atul Pitre and all the other faculty members of English Department and made an appeal to the students to make best use of the innovative measures and endeavors taken by the department for its students’ growth. Vice Principal Dr.Chitra Goswami too expressed her joy on this occasion and she gave her best wishes to the department. The programme was anchored by Prof. D.S. Kamble and the vote of thanks was given by Miss Shruti Salvi (TYBA). The students and teachers of Gogate-Jogalekar College celebrated the Kalidas Din on 17th July, 2015. Also on this occasion the the wall magazine of the department ‘Girwanakaumudi’ was published by the auspicious hands of Dr. Chitra Goswami, the vice principal of Arts Faculty. Dr. Kalpana Athalye, the HOD (Sanskrit) and Prof. Jayant Abhyankar, were also present on the dais. On this occasion Prof. Ruta Bhide delivered a lecture on 'Kalidas: a great nature poet’. She explained the literature of Kalidas briefly. Prof. Chitra Goswami, as the chair person for the function, in her speech reflected over the changes occurring in nature with the passage of time. Dr. Kalpana Athalye, at the end, expressed vote of thanks to all the dignitaries and the students present. 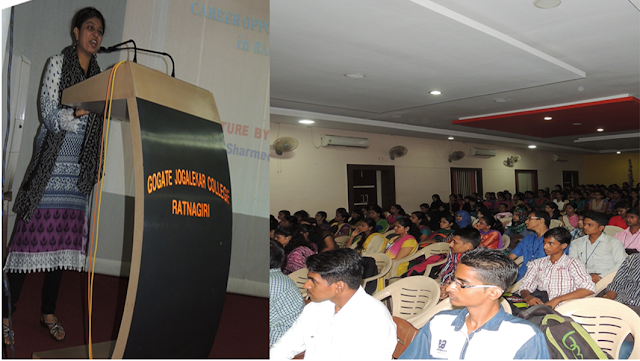 Lecture based on the topic ‘Career Opportunities in Radio Field’ held by RJ Sharmeen Jamadar took place in the Radhabai Shetye Auditorium of Gogate-Jogalekar College, Ratnagiri. Sharmeen was welcomed on behalf of English Department by Prof. Vasudev Athalye. Sharmeen jamadar, x-student and a famous radio jockey on FM rainbow , and the chief guest of the programme guided the students of Mass Communication and Journalism regarding the career opportunities in Radio, required qualification, training , availability of the courses and need for continuously updating talent and knowledge as an RJ. Sharing her experience and knowledge in a very friendly manner, she set before the students her own example of having excellent speaking and communication skills and motivated the students to look towards Radio as a different, creative and challenging career option. Priya Pednekar (SYBA) anchored the programme and Humera Thakur (SYBA), expressed vote of thanks. NSS Cell university of Mumbai University and R.P. Gogate Jogalekar College jointly organized planning session of NSS annual activities 2015-16. 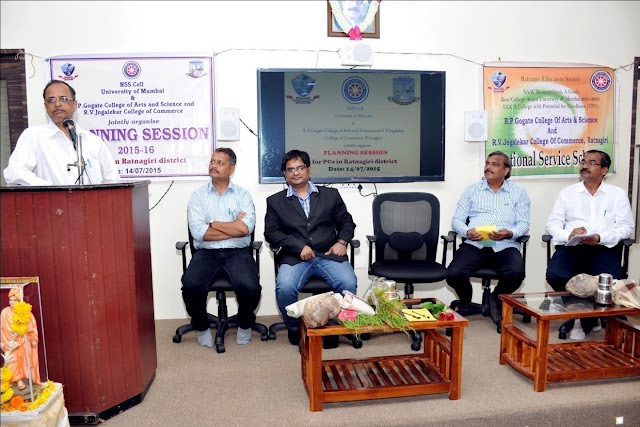 The programme was held for NSS programme officers in Ratnagiri on 14thJuly , 2015 at Seminar hall of Gogate Jogalekar College. Dr. Kishor Sukhatankar, Principal of the college, Mr. B. S. Bidawe, Coordinator NSS, Mumbai University, Mr Anish Chaudhari , Sub coordinator, Mr.Ramesh Devkar, Programme officer of Mumbai University NSS Unit and Mr.Rahul Marathe, district co-ordinator of Ratnagiri were present on the dais. Dr. Sukhatankar inaugurated the programme and guided that if NSS and other departments work unitedly; they can achieve great success and can innovate new things. The activities for the year 2015-16 were discussed and planned together by the authorities and the programme officers.